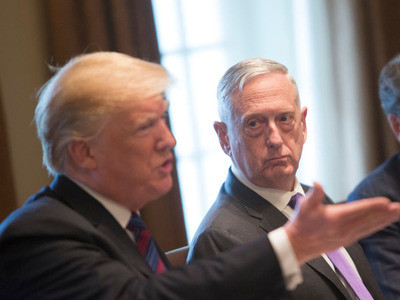 Chris Kleponis-Pool/Getty ImagesPresident Donald Trump and Defence Secretary Mattis. President Donald Trump told CBS’ “60 Minutes” that Defence Secretary Jim Mattis is “sort of a Democrat” and that “he may leave” the administration after months of speculation on the former Marine Corps General’s standing. Mattis, for his part, has consistently dismissed reports that he’s going anywhere, but has also repeatedly been seen as slow-walking some of Trump’s more out-there military policy moves, like his ban on transgender military service. In an episode set to run at 10 p.m. ET on Sunday, Trump pushed back on media reports that his administration is in chaos due to a high turnover of key officials. Asked specifically if Mattis would leave, after weeks of intensifying rumours about his impending departure, Trump left his fate ambiguous while revealing that he sees his top military official as a member of the political party that he’s described as the opposition and obstructionists. The president said Mattis hasn’t told him he’s leaving. “I had lunch with him two days ago, I have a very good relationship with him. It could be that he is [leaving],” Trump said. Mattis, for his part, has consistently dismissed reports that he’s going anywhere, but has also repeatedly been seen as slow-walking some of Trump’s more unconventional military policy moves, like his ban on transgender military service.